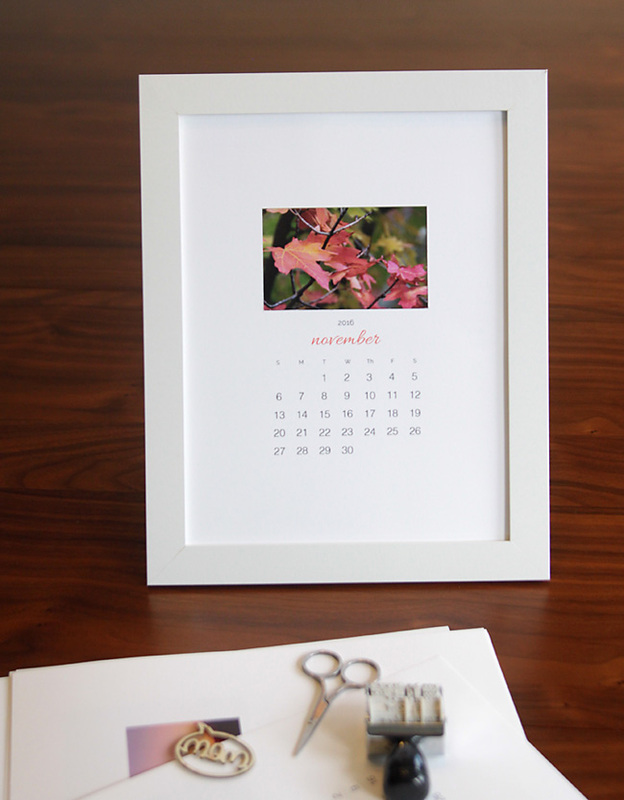 I’m betting a good percentage of us have made photo calendars before to give as Christmas gifts. 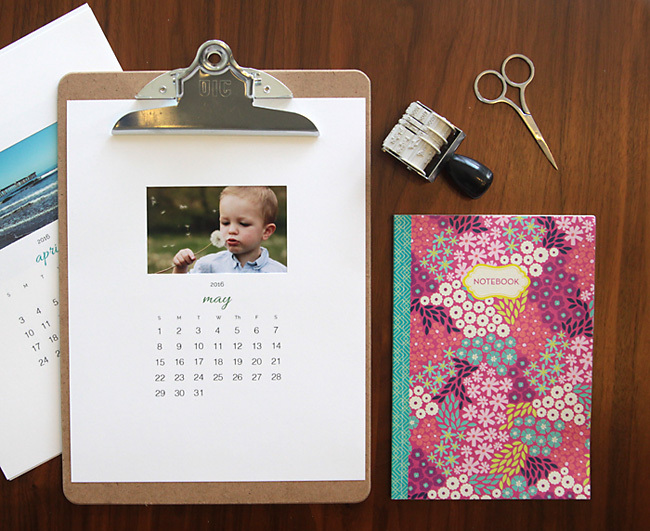 Because really, who wouldn’t want a calendar full of pictures of my kids? No one, that’s who. 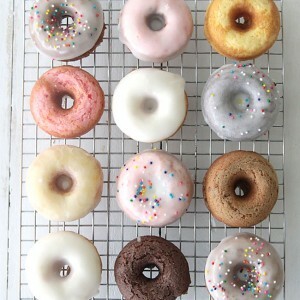 But I’ll admit I’m totally over the generic looking spiral bound photo calendars you can order from most photo places. If you’re going to give pics of your kids and call them a gift, why not do it in style? 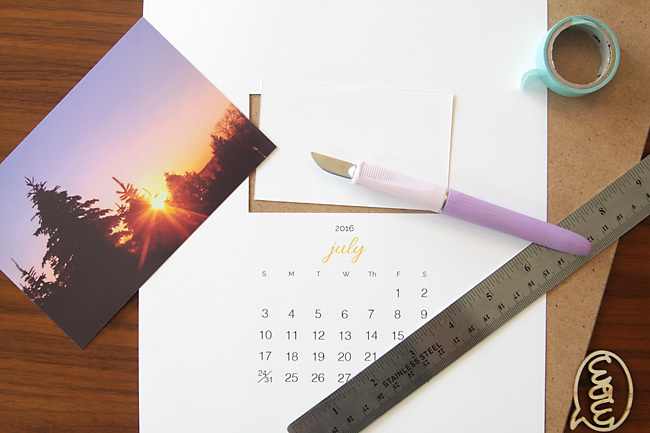 Hence today’s post: a cool, modern looking free printable 2016 photo calendar than you can personalize with your own photos for an easy, inexpensive DIY gift. The nice thing about this DIY gift is that (other than being practically free) it’s also totally customizable. 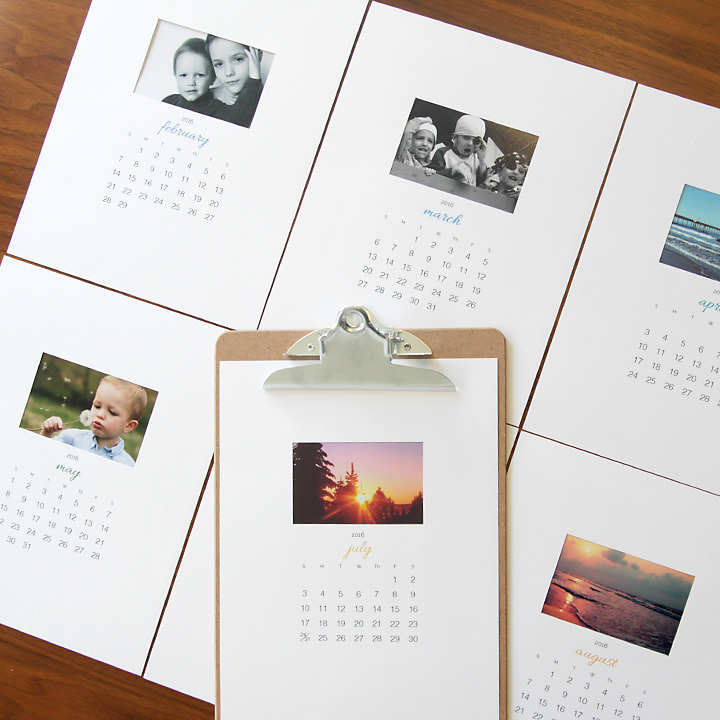 Use pics of your own kids to make a calendar for your spouse, or old family photos to make a calendar for your mom, or even pretty scenic pictures you can find free on the web (and I’ll tell you where) to make a calendar for anyone. Hey, want a mini version? Click here! 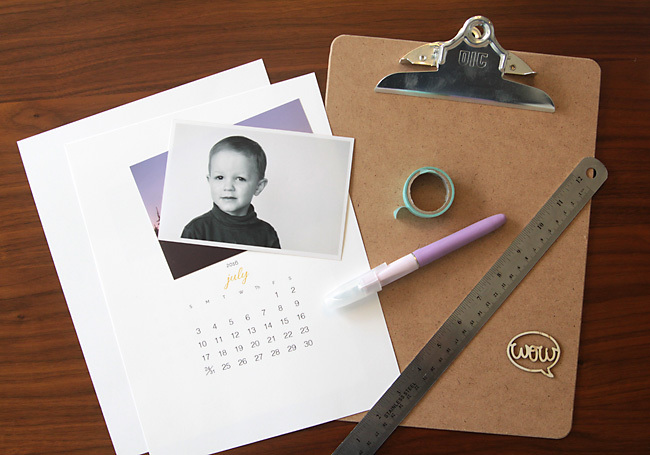 Add a clipboard or inexpensive frame and you’re good to go – one more holiday gift checked off the list. Easy, cheap, and beautiful. 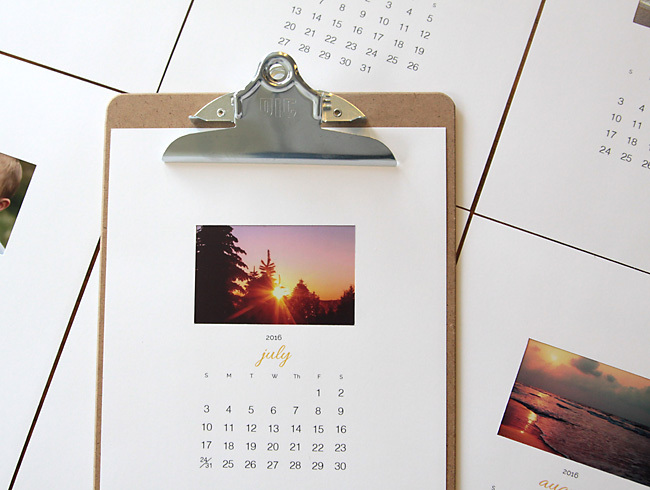 To make a 2016 photo calendar, you’ll need to download the free printables by clicking here. Print them onto sturdy cardstock at 100% or full size. Once all the pages are complete, slide them into a clipboard and you’re ready to give it away! 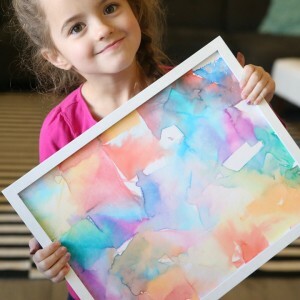 If you want to give them in a frame, either purchase an 8.5×11 document frame, or trim 1/2 inch off the top and bottom of each page and 1/4 inch off each side so they’ll fit an 8×10 frame. Either way it makes a very pretty, minimalist/modern gift. If you’re looking for beautiful, free stock photos to use in these calendars, check out Stock Snap. It has a searchable collection of beautiful photos that are absolutely free to use. It’s a fantastic resource! This is gorgeous! I love how fancy it looks, but how simple it is! My mom would love this for Christmas! This is so beautiful, simple, practical and functional! I saw last year’s post and was wondering if you were going to do a 2016, and here it is! Love the fonts and clean design you chose. I can’t wait to do this for my family. I hope I can find enough pictures to fit the landscape space! Thank you so much for sharing this! Such a nice idea! I was thinking of making one for a friend of mine with photos of her family. 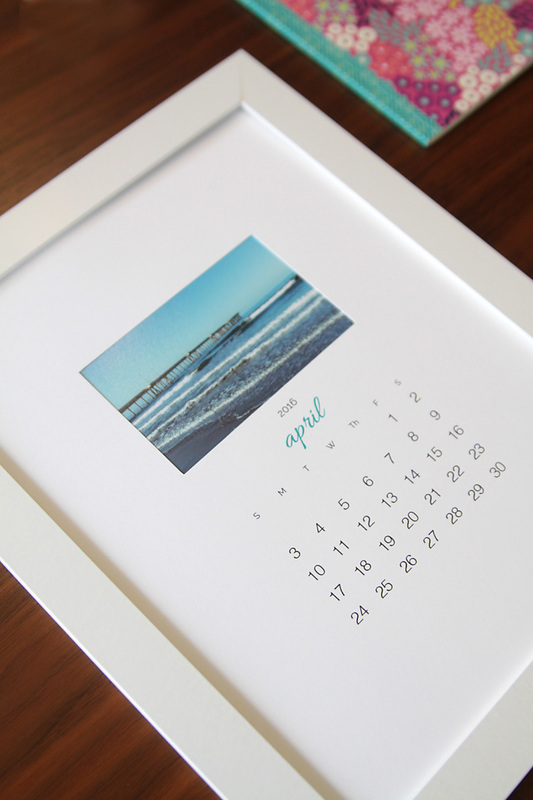 Can you just give me an idea, if I present it in a photo frame, where can I put the rest of the months? Thanks! Hi! 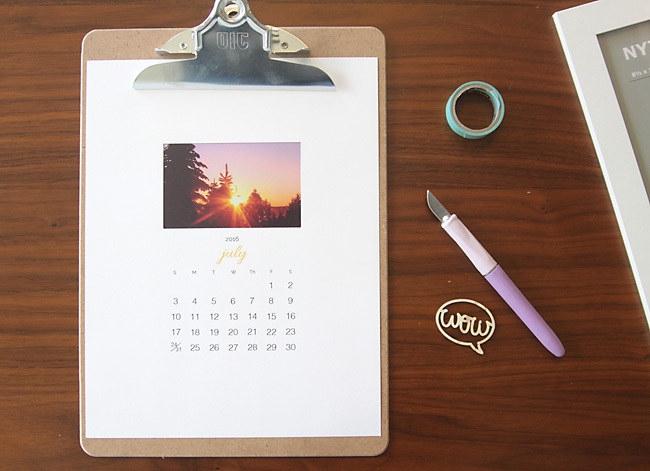 I was wondering if you had a link to a printable version for June 2015 calendar. I saw these and thought it would be a great gift for sister. Her daughter was born June 21, 2015 and I wanted to put a picture of her that day she was born with the date she was born circled. This website is awesome!! 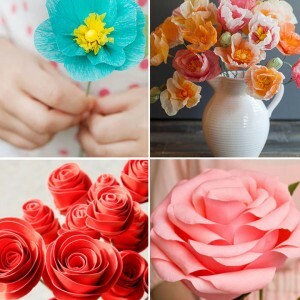 I love it because i love craft and the instructions are very easy!!!!!! any chance you can make these for 2017?? I LOVE This idea! I’m wondering the same thing. This is gorgeous and would make a great gift for my family. I’m looking for the same thing for 2017! This would be perfect! Yes, yes. I would LOVE to do this for 2017. I would REALLY appreciate an update for 2017! 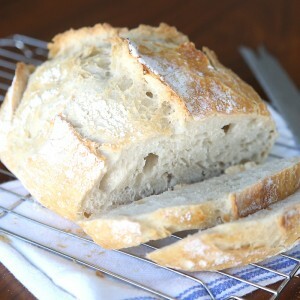 I feel like I should be able to do this myself, but know it would not look nearly as gorgeous as what you have created. Thanks in advance! I love this project–any chance you will do this for next year? I would love the template to make gifts for Christmas.